It’s that time of year again. Farmers rural and urban have donated veggies. Potters professional and amateur have made pots. People have generously donated their time and chopping skills. Another Empty Bowls * is upon us. It’s a national concept that we have put our own South Minneapolis spin on. This year we even have bakers making bread at a new on site earthen oven. For one day Powderhorn Park becomes the community living room where folks from across the city get together to break bread with one another. Folks attending the event are asked to make a free will donation for a handcrafted bowl and soup meal. Attendees go home with a full belly and a beautiful empty bowl. This bowl serves as a reminder of the need in our community throughout the year. 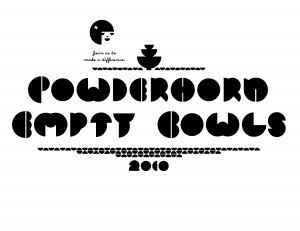 Powderhorn Empty Bowls gives the money to organizations in South Minneapolis who are helping to feed those in need. It is a win for everyone involved. As a potter it is a great way for me to give back to my community directly. Over the years we have raised thousands of dollars for local food shelves. If you’re in South Minneapolis on Friday stop by and have a meal. I’ll be in the kitchen making soup from scratch all day, pop your head in and say hello. Our event runs from 11 am to 7 pm or until we run out of soup! This entry was posted in Uncategorized on November 4, 2010 by Jennie. I have always contributed to the local empty bowls event, ours sells tickets and the money goes to a local group against domestic violence. But we have moved away this summer and I am without a studio. It feels weird not to be throwing tons of bowls! I’ll be ready next year for sure. What a great idea! I’m way too far away, but I did share on FB as I’ve got friends in Minneapolis!